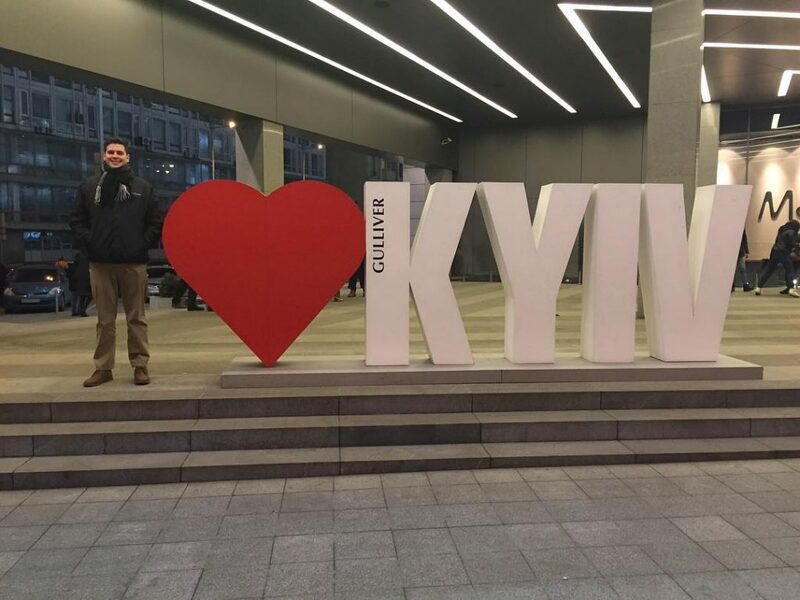 Josh DeMoss in Kyiv, Ukraine. 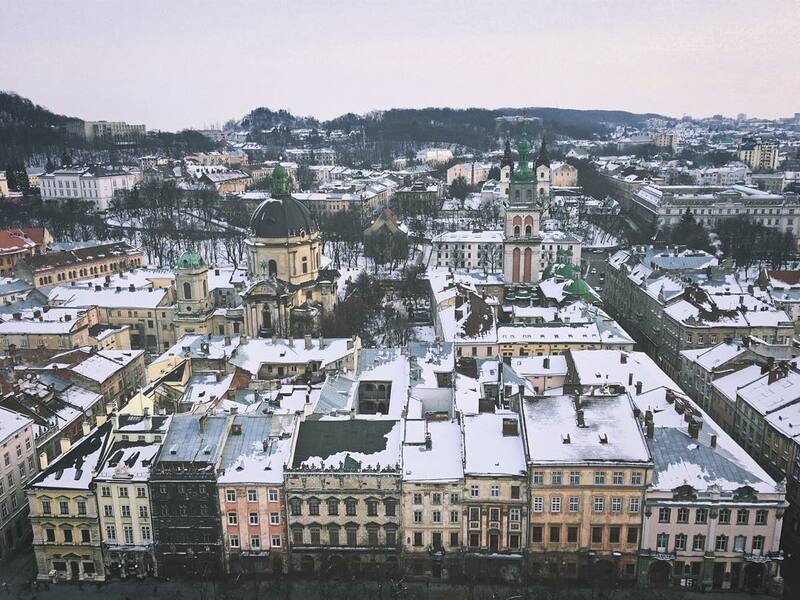 As a JD/MA candidate in Russian, East European, Eurasian Studies and Law I’ve long had an interest in Eastern Europe, but it wasn’t until I studied international trade at KU Law that I began to focus my studies on Ukraine. During my 1L year, the Euromaidan protests ensued, Crimea was annexed, and the conflict in Donbas escalated. Media outlets mentioned Ukraine nearly every day. Ukraine and the EU signed an Association Agreement (AA), which includes the Deep and Comprehensive Free Trade Agreement (DCFTA). I recognized new prospects and challenges would arise from these relationships, and as an aspiring international trade lawyer, I wanted to learn more. I had studied Russia and Russian language, receiving a BA in Russian and International Relations. I knew studying another Slavic language and country would give me a leg up in the field. I focused my research on Ukraine’s international trade system, particularly its challenges in shifting from predominantly trading with Russia, to openly trading with the EU, and adjusting to a new market and requirements. 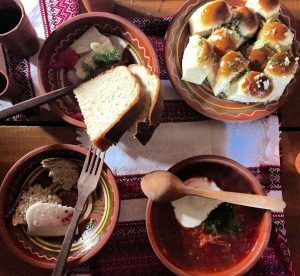 I realized if I really wanted to improve my language skills and understand the complexities of the culture, economics, rule of law, and politics, I had to go to Ukraine. I researched programs from which the ABA accepted credit, and approached Dean Kronk-Warner about the possibility. I was approved by the law school and by the university (Ukraine is under a travel advisory from the State Department and required further permission), and received a scholarship. I enrolled at Kyiv-Mohyla Academy, a well-known and reputable university in the region and the oldest in Ukraine. During my time studying, researching, and living in Ukraine, I used Russian and Ukrainian every day. Ukraine has a bilingual polity, likely more so than any other country in the world. I found it frustrating when I wanted to speak one or the other: menus in Ukrainian, waiter speaking Russian, professor speaking Ukrainian, advertisement in Russian, etc. I worried that I would speak someone’s second language or offend them. Then I had an opportunity to go to a village of my one of my friends in Central Ukraine, and everyone there spoke “surzhik” (a mixture of the two languages). I learned to relax and find common language. As a foreigner, most assume if you are going to speak a foreign language you speak Russian, but on three different occasions, people told me it touched their heart when I spoke Ukrainian. Besides understanding the language, conversations in classes and at activities such as Ukrainian speaking club allowed me to understand diverse viewpoints about Euromaidan, politics, the tensions with Russia, Ukraine’s future, and the DCFTA, which came into force when I arrived in Kyiv. One of my professors worked at the EU Mission to Ukraine, so she informed us of the developments. As a result of my Ukrainian studies and research, I have been awarded some great opportunities. I interned this summer at the joint United Nations/World Trade Organization agency, the International Trade Centre (ITC). I worked in the Office of East Europe and Central Asia, and one of the primary reasons ITC offered me the internship was because of the agency’s new project in Ukraine. I helped Ukrainian fruit and vegetable exporters enter the EU market and comply with DCFTA standards. I was able to convey to businesses how the system works and how it is beneficial to Ukraine and the EU. I plan to build upon these experiences to pursue a career in diplomacy and international development through trade. Traveling around Ukraine and enjoying the culture was just as enjoyable as my professional and academic work. 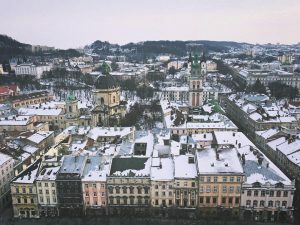 From seeing beautiful cities such as Lviv and Odessa, to mustering up the courage to visit Chernobyl and mourn the tragedy on its 30th anniversary, to wearing a vyshyvanka (a hand-embroidered shirt) and eating borsch with salo (a beet soup with cured pig fat), it was a truly valuable experience. I would encourage any law student to learn more about developing markets and seek opportunities there. For me, it is Ukraine, and as it is known as the breadbasket of Europe and for its sunflowers, Ukraine is not so different from Kansas. – Josh DeMoss is a 3L from Gilmer, Texas.